Fall is nature’s way of easing us into winter weather. I love everything about fall in California – the crisp morning air and sunny afternoons, the warm colors and cozy feelings, and especially the fall flavors of pumpkin, cinnamon, and nutmeg. If you’re enjoying the fall flavors as much as I am, you’ve been stocking your refrigerator and pantry with all the fall essentials. Fresh and canned pumpkin, all the varieties of squash you can get your hands on, all things apple related, BRUSSELS SPROUTS (my favorite veggie! ), warm spices, etc. I could go on forever. Did I mention I love fall? My head has been spinning with fall recipe ideas. Boo for school and work, otherwise I’d be in the kitchen cooking up spiced muffins and loaves, apple sauce and hearty stews. I need to clone myself so I can pay the bills, stay at home cooking and eating, while simultaneously trying to take over the world. Who can help me with this master plan?! Anyone? Until I figure that out, I’ll stick to my late night and weekend recipe development. Like this Pumpkin ‘Granola’ Crunch I came up with! I had to do it. My roommate Ariel, who I call the ‘Queen of Granola’, swears by her granola and yogurt combination. I love the idea of having that kind of sweet and crunchy snack around, but without the rolled oats, added sugars and ingredients typically found in store bought granola. A trip to the store later, I was ready for an oatless paleo version of granola, fall edition. This granola HIT.THE.SPOT. Crunchy and sweet, with all the warm flavors of fall to keep you satisfied. Happy fall snacking. Preheat the oven to 300º (F). While the oven is preheating, pulse the hazelnuts and almonds in the food processor a few times. 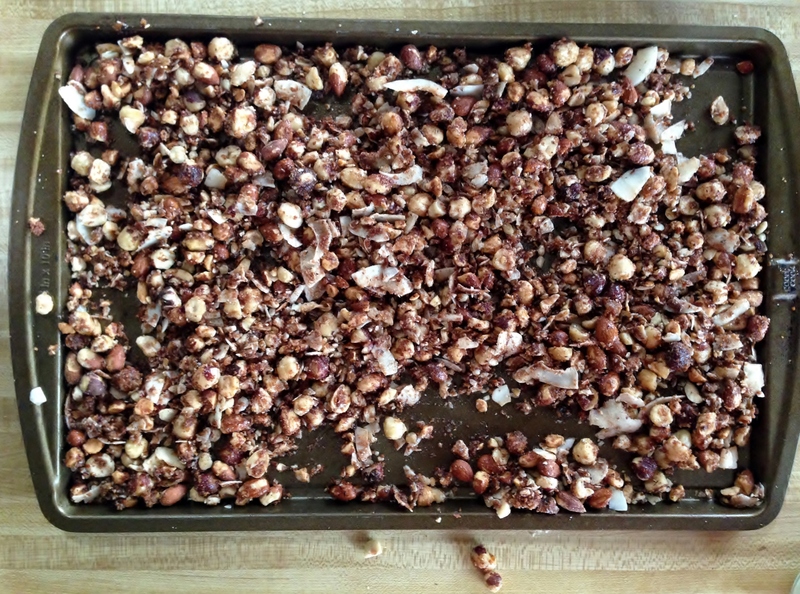 The goal is to chop the nuts into chunky pieces, without over processing. Otherwise you’ll end up with a big batch of granola ‘crumbs’. You know what I mean, that last bit at the end of the bag that you want but you can’t scoop out with your hands, so you tip the bag over into your mouth when no one is looking. Yeaaaah, you know you’ve done it! Where was I? Nuts. 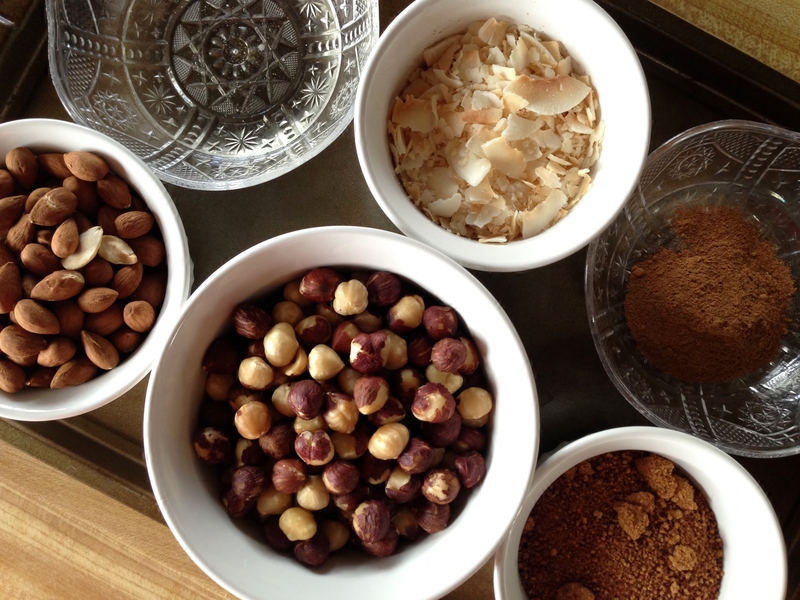 Pour the chopped nuts into the mixing bowl and add the coconut flakes, coconut sugar, pumpkin pie spice and dash of salt. Give that a good mix, and then add the coconut oil. Mix until everything is completely coated by the coconut oil. Divide the batch into equal portions and pour onto the two baking sheets. Bake for 8 minutes and let rest until completely cooled. 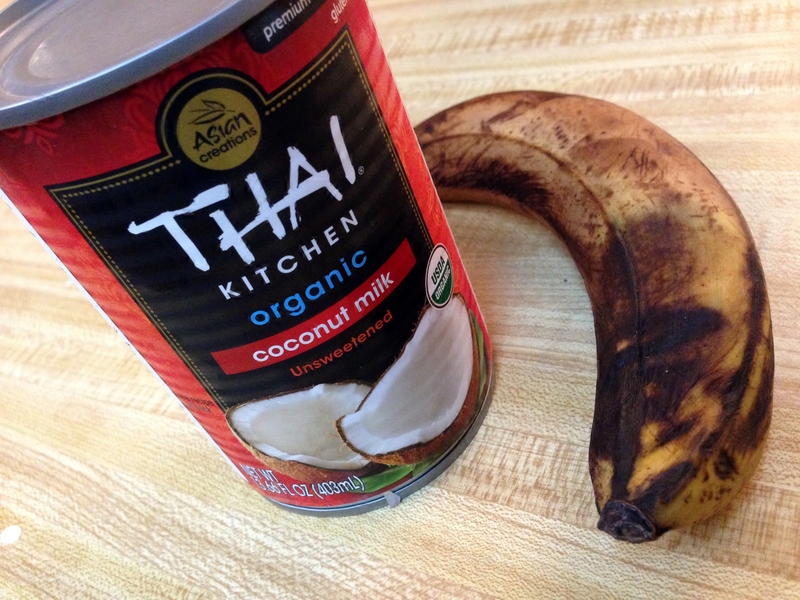 I’ve been eating this over my simple banana cream for a really amazing treat. Try it! You won’t be disappointed. 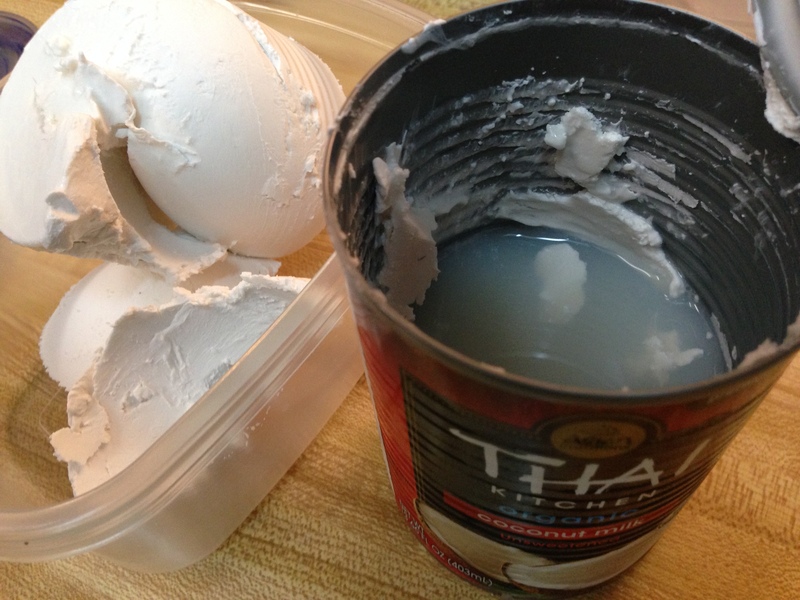 Note: Use the coconut water that’s separated from the cream at the bottom of the can. 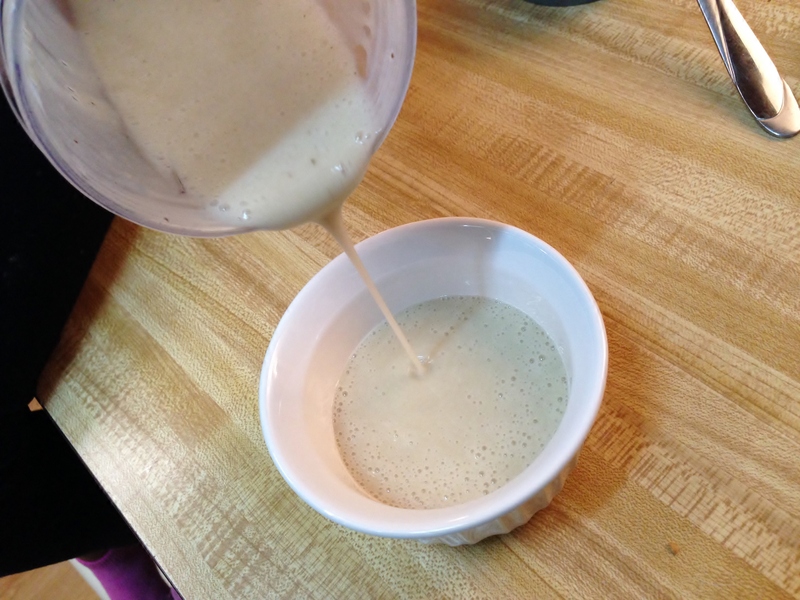 The cream can be saved for about a week and used for pretty much anything – coffee creamer, cooking, baking, smoothies, etc. 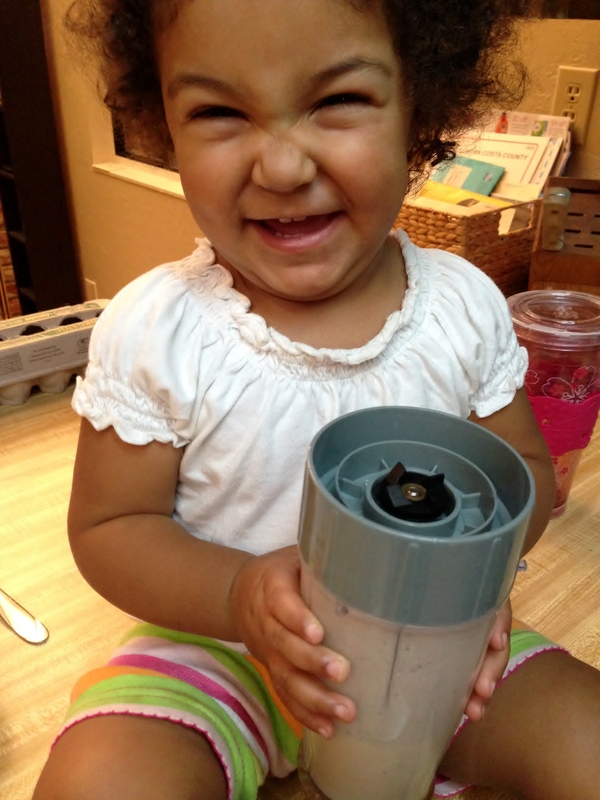 Step 1, recruit little midget helpers with melt-your-heart smiles. Meet Destiny (top) and MiAmore (or Mia, bottom). 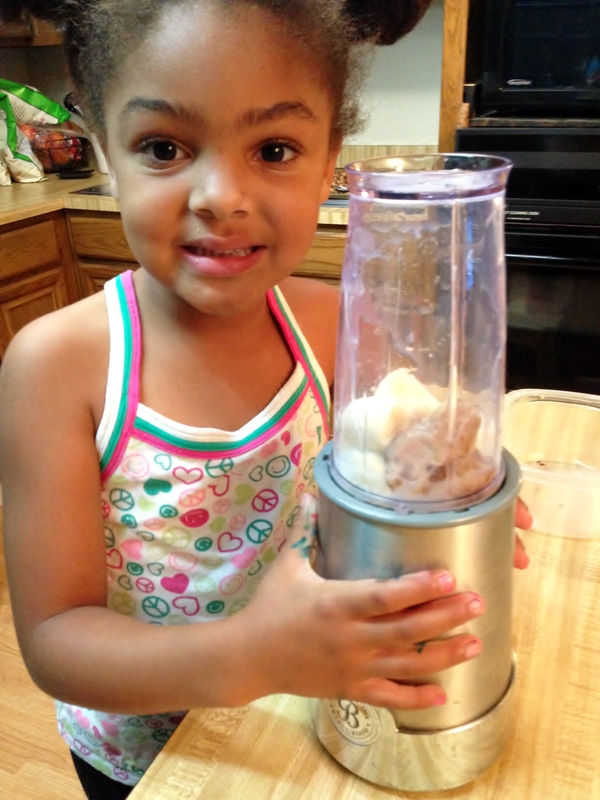 Step 2, have the tiny helpers put the ingredients in the blender, and blend until smooth. Step 3, make sure the baby approves. Isn’t she cute?
. 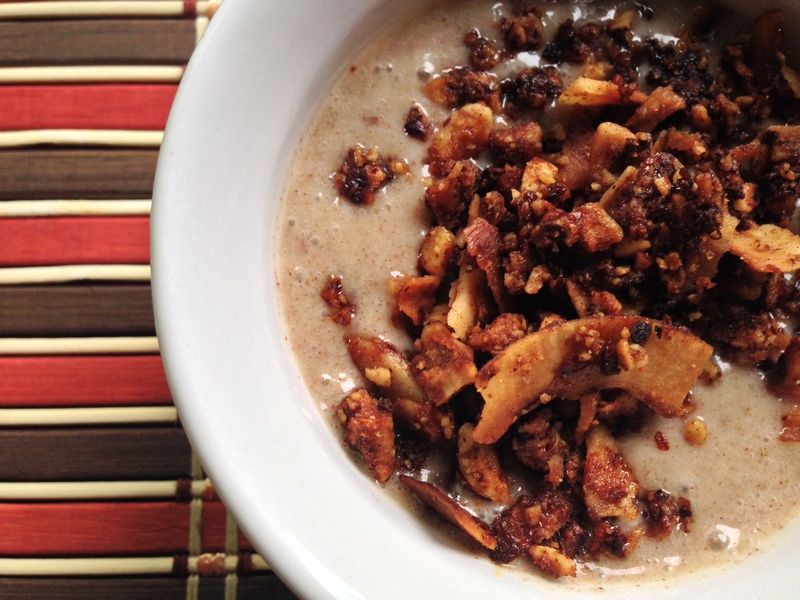 This is best when topped with the grain free pumpkin ‘granola’ crunch! Is anyone else having as much fun as I am with fall flavors? What kind of amazingness are you whipping up? Share away!